It Uses tab to transients to grab a bar at a time. These BC's are in the music tab under "Tempo Map 1 bar" you will also find "Tempo Map Verse,Chorus,ETC" if you use the BC for create session markers and place the markers right on the transient every 8 bars then it will map using the markers instead of transients like "Tempo Map 1 bar or 2 bars"
Basically "CMND+I" opens up the tempo window so you can use "TAB" to get through the menu then using "Shift+NUMPAD-" to nudge back and "CNTRL+OPT+CMND +' " to highlight the next bar and run the sequence again.. If the drummer is really speeding up then change the nudge value from .001 to like .100 or .500 ms to deal with the speed ups..
its also pretty easy to do with Beat Detective. Bar Beat Marker Generation but its hard to make a BC for that since you can't tab through the start end times. This is very similar to what I was trying to do and what I inferred from replaying the video a few dozen times. I think the delays (or lack thereof) were causing problems. I am unable to enter the ctrl+option+command+' command to move the cursor to 'next end' though. When I do this, all I see is "enter key combination". Perhaps this is a bug? 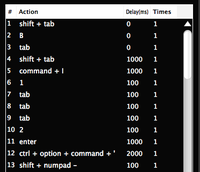 I am using the standalone batch commander on a mac. I do not yet own a raven. Actually I am considering purchasing the Raven but wanted to evaluate batch commander first before making a purchase decision. Anyhow, other 4 finger commands seem to be working such as the ctrl+option+command+; to go to previous start/end. I just cannot input the command for next start/end. Also, I believe line 4 should be ctrl+shift+tab, but I am not able to enter this command in the batch commander editor either. you should be able to just link 1,2,3,4 and it will map the first 4 bars.. of the song. I seem to prefer using Tempo Map verse,chorus Markers for this though.. This way you can do 8 bars at a time.. I got it. I have a few dozen songs that need to be mapped tonight. The drummer plays fairly straight on all of them. I created a few macros that group it into 50 bars at a time and then a behemoth that does all 100. I just tested the first song with the 100 bar batch command. It got to bar 89 and then I had to manually stop it (there were only that many bars in the song). I also created a handy batch command to consolidate and do some basic garbage collection upon completion. This is going to save me hours of tabbing and command+i'ing my way through live recorded material. Thank you SOO MUCH! I'll acknowledge that there are a few unnecessary steps (no real need to label the end bar), but it was faster to copy/paste to create the batch command this way. If you wanted to spend the time, you could clean this up and make it operate a little faster. I incorporated the tab command into the macro, so all you have to do is highlight the first bar, set nudge value to 100-200ms, and then start the batch command. In the case of errors, you can break the command up into bar sections and manually adjust any odd groves. I have bars 1-50, 25-50, 50-100, and 75-100 programmed in my layout. This type of routine would be much easier to code if batch commander had some sort of iterative programming ability. For example, being able to define a variable for measure number (lets call that 'n'), we could make the next measure n+1. Rather than having to modify those lines manually to define measures, we could just copy and paste over and over again. I don't know if you'd be interested, but it is something you might mention to the programming team as a possible new feature. Regardless, the hour or so I spent writing this up will easily pay for itself over the coming months. If you do this type of thing often, you know that tempo mapping can eat up hours of the workday quickly. amazing stuff. love the ideas.. I like the the consolidate at the end.. to clean up all the edit.... I think maybe a CMND H could do the same thing.. maybe i'll try to add that after each bar so it cleans ups right after..
thanks a lot for sharing the scripts.. i am gonna bust these out on some live records..